21mm engineered hardwood is made from a solid hardwood wear layer (the top of the flooring) which is usually 5mm or 6mm and then the rest is a mixture of core layers and base layers which have been constructed underneath the top layer. The core and base layers are usually made from plywood and they each run perpendicular to the next layer, which gives the planks of flooring its dimensional stability. All of the layers are bonded together with adhesive, using extreme pressure. Once the flooring has been installed, the only part of the engineered plank you will see is the wear layer. As an example of how the plank is constructed, for a 21mm thick floor, which has a wear layer of hardwood of 6mm, the remaining 15mm of the plank is made from the core and base layers. This type of flooring is available in tongue and groove fitting, in a range of board widths and lengths and with a choice of different surface textures and finishes. Why should I choose 21 thick engineered flooring? 21mm engineered hardwood flooring is a really popular type of flooring as it has all of the benefits of engineered flooring (strength, stability and versatility), while having a surface of solid hardwood giving the feel of luxury and natural beauty. For more information about the engineered wood flooring, why not have a look at our Guide to Engineered Wood Flooring. As the wear layer of this flooring is usually a substantial thickness, it has the ability to be sanded down and refinished a number of times. This means that the flooring will essentially last longer as you can prolong its life expectancy by giving it a refreshed and renewed appearance when required. 21mm engineered hardwood flooring is compatible with fitting over joists. It is thick enough to have the correct load bearing properties and strength to cope with the added pressure and weight that comes with being installed over joists. 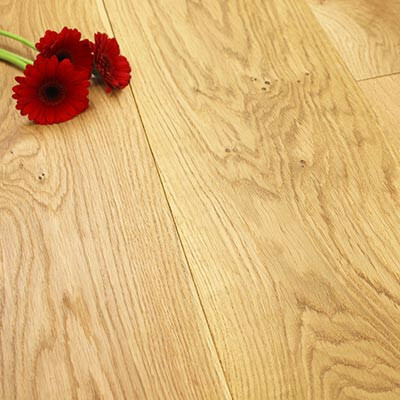 This particular thickness of engineered wood flooring has a tongue and groove fitting system. This means that you have the option of either floating the floor over an underlay or fixing it directly down to the existing subfloor. If you would like to find out more about fitting your floor, have a look at our Installation and Fitting Guide. How do I maintain 21mm engineered hardwood flooring? 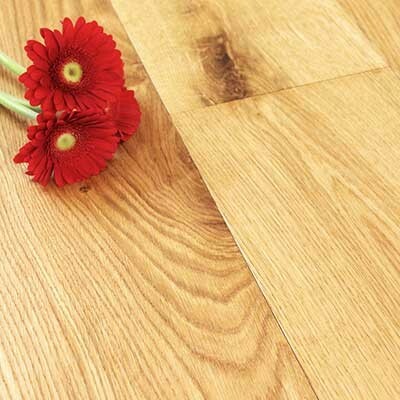 Like any hardwood flooring, 21mm engineered hardwood is very easy to look after. Firstly, you will want to avoid any unwanted damage by removing footwear before walking on the floor, adding felt protector pads to the bottom of furniture and wiping away any spills immediately. Cleaning the floor is straight-forward. Brush with a soft broom on a daily basis to remove any dust or dirt, and then clean on a weekly basis (or as needed) to get rid of any stubborn stains. Have a look at our range of cleaning products that have been designed especially for wooden floors. To discover more about looking after your new floor once it has been installed, read our Wood Floor Care and Maintenance Guide. Yes, we stock engineered wooden floors in a range of different thicknesses so there is sure to be something to suit your needs. For any further help and technical advice please contact us or come along to our showroom where our technically trained staff will be happy to answer any questions that you may have. Our showroom has all of our floors and flooring accessories on display. Alternatively, you can order some free samples of our flooring if you want to look at the products at home.